Garden enthusiasts have the chance to hear from multi award-winning landscape architect and garden designer Tom Stuart-Smith at a special dinner being held at The Carpenters Arms Inn, Felixkirk, North Yorkshire, on Tuesday. 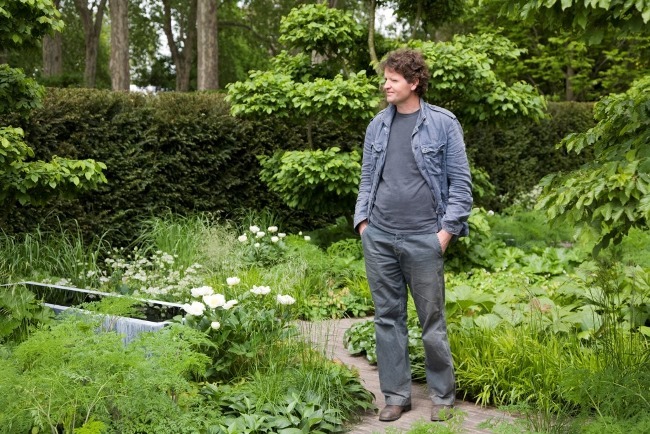 The winner of eight Chelsea Flower Show gold awards and designer of the Queen’s Golden Jubilee garden at Windsor Castle will consider: ‘Why we create gardens, and what qualities make them interesting places to visit’. He will also talk about his work, including the inspiration behind the landscaped gardens and grounds of the private Mount St John Estate that is located just half a mile from The Carpenters Arms, and supplies the pub’s kitchens with seasonal produce including heritage varieties of fruit and vegetables. In celebration of the spectacular gardens and to showcase the fantastic produce grown there, guests are invited to a four course gourmet dinner followed by an audience with the designer. Tom has earned an international reputation for creating both private and public landscapes that combine naturalism and modernity. Tom has agreed to give the talk in exchange for a donation by Provenance Inns to New Ways, a charity that funds the creation of agricultural development projects in Turkana, Northern Kenya. The Carpenters Arms was voted Yorkshire’s Favourite Pub at The Great Yorkshire Show by Welcome to Yorkshire.